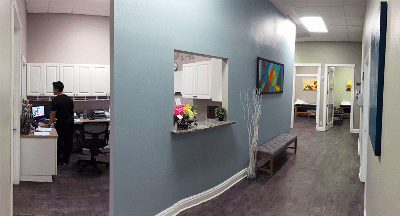 Florida Orthopedic Foot & Ankle Center offers physical therapy on-site in our office. Dr. Cottom is a strong believer in the benefits of physical therapy in treating many pathologies of the lower extremity. Therapy, along with other conservative methods is often used as first-line treatment for many orthopedic problems with excellent results. We also employ therapy as part of our postoperative protocol in the majority of surgical procedures performed. Having one team under one roof is ideal for continuity of care. At Florida Orthopedic Foot & Ankle Center we strive to give each patient the individual attention that they deserve. Our therapy department is no different and is staffed by only 2 full time certified physical therapists and one physical therapy assistant. We believe in one on one treatment so patients are scheduled so that they have one on one treatment with the therapist. We do not believe in having a room with 15-20 patients in it at a time and a few therapists treating all of them! Furthermore, physicians are on site in case a patient has a question about their treatment or just want to chat. Come and see what a difference individual PT can provide you on your road to recovery. Affiliated with Spine, Sport & Physical Medicine Center in Sarasota, all upper and lower extremity orthopedic conditions can be treated. Please call 941.924.8777 for more information.